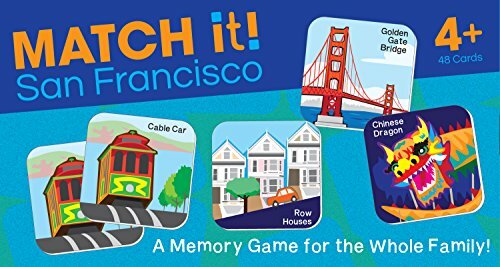 Rediscover a classic memory game with a San Francisco style! This set of 48 matching cards features the best and the coolest sights and symbols in the City by the Bay, including the magnificent Golden Gate Bridge, the iconic cable cars, the really crooked Lombard Street, and the loud (and fun) sea lions at Pier 39. If you have any questions about this product by Duo Press, contact us by completing and submitting the form below. If you are looking for a specif part number, please include it with your message.